I hope you find great value in these Quotes about Speech from my large collection of inspirational quotes and motivational sayings. Free speech is not to be regulated like diseased cattle and impure butter. even for the same performance. Private religious speech can't be discriminated against. It has to be treated equally with secular speech. and kissing a girl who is leaning away from you. desires to rise to the divine platform. which is totally due to my fans. and so in that respect Adam himself came in under her covenant. tasks which they perform in language. adding visual chaos to the confusion of voices. What role does silence have in all this noise? I was catalogued as a heavy. Hubert, a speech doesn't have to be eternal to be immortal. the world on fire was a figure of speech. Better a thousandfold abuse of free speech than denial of free speech. to be asked to make a speech. and then gives birth to it in a speech. It doesn't matter who makes a political speech. wants to make a political speech as well. From my earliest days I have enjoyed an attractive impediment in my speech. I have never permitted the use of the word stammer. I can't say it myself. 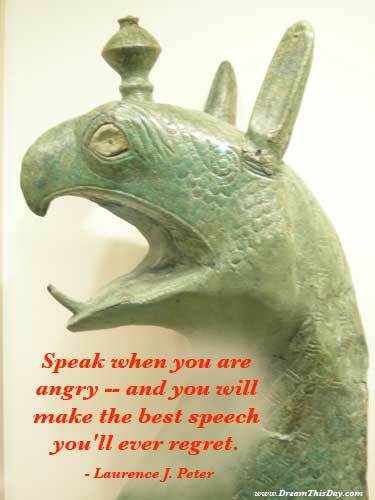 Speech is human nature itself, with none of the artificiality of written language. and my mother's contempt for my father. involving neither physical proximity nor speech. creates new speech out of stuff that's already there. is the hour of your thoughts. the defense of the indefensible. He was reading what was given to him in a speech. Silence remains, inescapably, a form of speech. as a real and serious medical problem. and cacophony of the unfettered speech the First Amendment protects. of which I have spoken. not necessarily great power, but as much as the speaker is capable of. Verse, singing, and speech have a common origin. we can't seem to define it, but we know it when we see it. these days it takes the first to make yourself heard. the language; third the proper arrangement of the various parts of the speech. and employ speech only to conceal their thoughts. but rather from heart to heart. or in a magic that acts on it through speech. lest they should be set to earn their livings. freedom of speech and our desire for healthy campaigns in a healthy democracy. building it around the natural breath structures of speech. Speech is an arrangement of notes that will never be played again. Thank you for visiting: Speech Quotes.